Thank You for selling me your Maxtor Diamond Max plus 9 80G for a cheap price. Here's a tip: Once you see Darkane selling an item, if you need it, then go bid for it immediately, you don't want to see yourself falling in line with other buyers. Very professional si sir darkane. Eventhough hindi siya yung kumuha ng item (sister niya), very clear and easy ang naging communication namin. Thanks for buying my item. Until next time bro! a smooth and hasslefree transaction with another excellent buyer!! looking forward in having another deal with you. bro thanks for buying my 3d rocket II hope you like it..
very fast and smooth po ang transaction namin ni sir :D ok na ok kadeal :D hope you're happy with your items! :D sa uulitin! 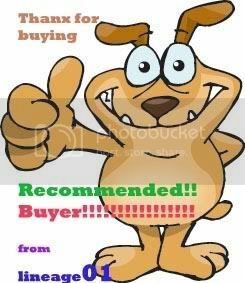 highly recommended buyer - evemaster certified! bought an arctic silver from me. No hassle very smooth transaction. Deal kami kaagad. NICE PO KAYO KA DEAL SIR..YOU TRY YOUR BEST TO FIND THE OTHER ACCESSORIES PARA FAIR SA BUYER..AND CONVINIENT TO OUR MEETING PLACE KAYA AKO NG LUMAPIT PARA MAS MAPADALI...TILL OUR NEXT TRANSACTION SIR..
thanks po sa pagbili :) sa uulitin! Sorry Sir Darkane kung late na feedback ko. Thanks for selling your sister's Omnia Pro!! At yung phone still in superb condition.